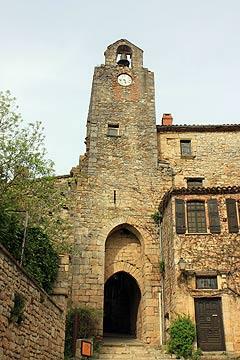 Bruniquel is a village situated 25 kilometres east of Montauban in the Midi-Pyrénées and is listed as one of the 'most beautiful village of France'. 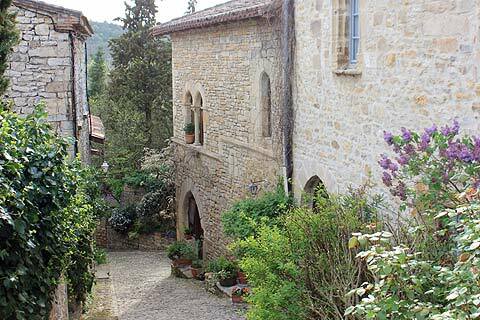 It is in a steep hilly location next to the Aveyron River in beautiful wooded countryside. 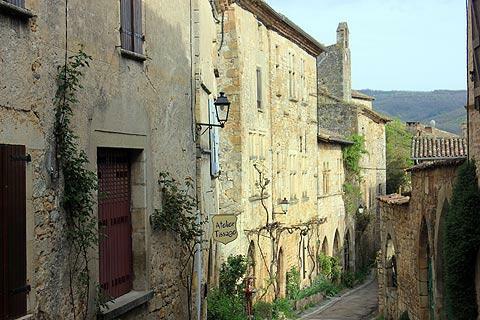 You can enter Bruniquel through one of the medieval gateways in the defensive walls, and explore by following the steep cobbled paths passed the old stone buildings in this picturesque fortified village. There are various pretty streets in the centre such as Rue de l'Hopital, Rue Bombe-Cul and Rue Trotte-Garce, and sooner or later all streets lead to the Place de l'Horloge, the centre of Bruniquel that is dominated by its tall stone clocktower. Among the highlights in the village are a wooden house called the Maison Belaygue and the Maison Payrol, a luxurious 15th century manor house just below the castle: visit to see what luxury living was like in Bruniquel 500 years ago. Be sure to see the two lead hearts on display both of which apparently contain real human hearts! Much of the beauty of the village lies also in the detail - the stone doorways, the turrets, etc - and the feeling that Bruniquel has not changed for many centuries (it has been used in a period film because of its unspoiled authenticity). There is also an interesting belfry in the village above a stone gateway, and several small open squares. As well as the main village be sure to take the Rue du Barry south from near the church to reach place du Trouquet, and then along the rue de la Fontaine to see the traditional washhouse. It is the two medieval castles here that dominate both the village and the surrounding valley, being constructed on a rocky platform that is higher than the rest of Bruniquel. Why two castles? In the 15th century the owner of the so-called 'old castle' sold a part of the terrain to a cousin after a family disagreement, who then built the 'new castle' adjacent to the old castle. The older 12th century castle (built on the ruins of an earlier 6th century castle, claimed to have been founded by Queen Brunehaut, daughter of the king of the visigoths) has a long gallery with startling views - not for the vertiginous. This castle has some very impressive features, including the gallery itself, the knight's room, and the Reine Brunehaut Tower. 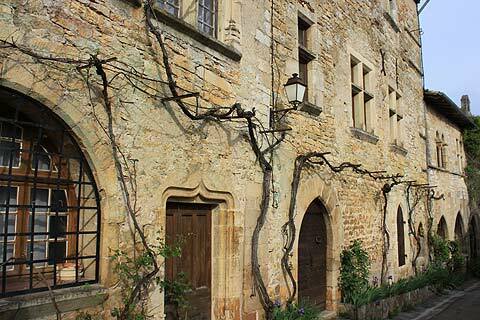 Art exhibitions and permanent exhibits about the history of Bruniquel can be seen in the chateau. There is also an exhibition about the making of the film "Le Vieux Fusil" which was filmed in Bruniquel and particularly the Chateau of Bruniquel. The film was made in 1976 and won the Cesar award for Best Film, Best Actor and Best Music. It is based on the true story of the massacre of Oradour-sur-Glane. The later castle dates from the 15th century, and now contains a museum of prehistoric artefacts from the region. Most of the artefacts are from nearby caves including the Meyrieres Cave and Bruniquel Cave*. Remarkably the ancient wall paintings in the former of these caves were erased in the early 1990's by graffiti cleaners! The entrance door of the castle and the wooden carved fireplace are both in the Baroque style and worth noticing. * Bruniquel cave itself was only explored during the last 20 years and found to contain significant items and evidence of occupation dating back almost 50000 years. The cave is not however open to the public. 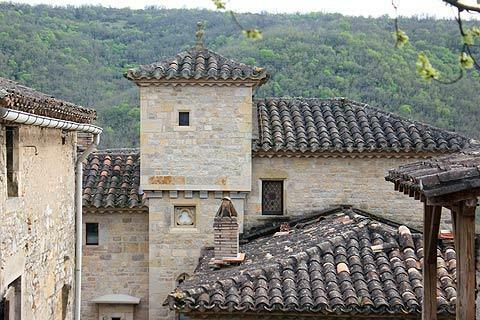 The main attraction around Bruniquel is undoubtedly the countryside and the small villages hidden in the countryside. 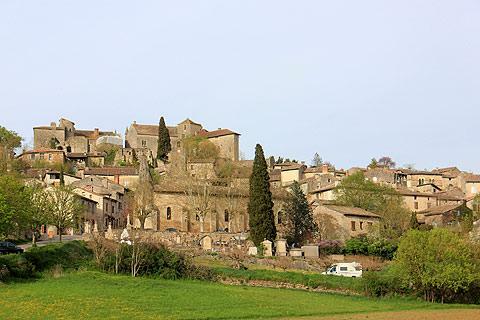 One particular highlight we recommend is the village of Cordes-sur-Ciel about 25 kilometres east of here.